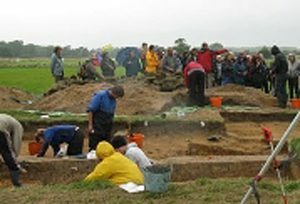 It was previously thought that the hunter gathers of Mesolithic Britain were nomadic, never putting down roots or leaving traces of occupation. 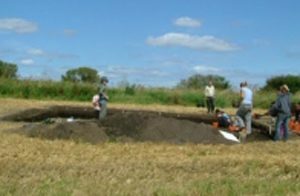 This idea is being challenged with the unearthing of what looks to be the most significant discovery of its time – the excavation of a wooden dwelling dating back more than 10,500yrs. At the time, the end of the last ice age, Britain was still connected to continental Europe by a string of hills across the English Channel known as the Weald-Artois rock ridge. 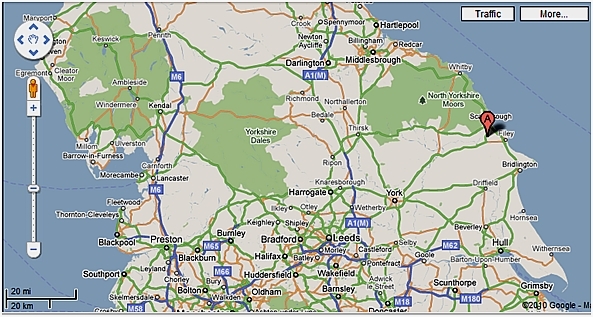 The site, known as Star Carr (http://starcarr.com) is located in Northeast Britain not far from the current coast line at Scarborough and adjacent to what would have been a large lake. It was first discovered in the 1940’sand was marked as an area of historical importance with the finding of twenty-one headdresses and a collection of amber, shale and tooth beads. 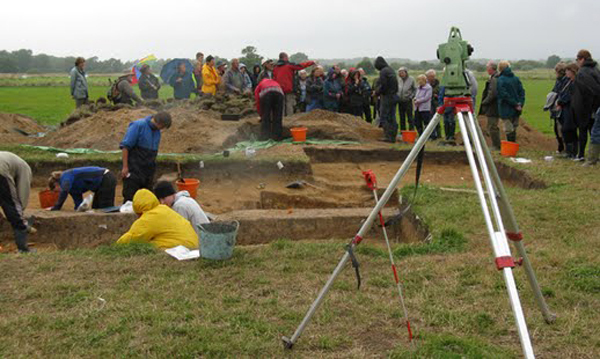 Work resumed in 2004 and recent excavations by a team from York and Manchester universities have revealed a wooden platform or jetty that shows the first evidence of carpentry in Europe with split and hewn timbers. Thought originally to be for boats, suggestions have been made that this was a ritual offering point for depositing in deeper lake water. The homestead, a circular construction consisting of eighteen post holes, is 3.5mts in diameter and is thought to pre-date Stonehenge by about 6,000yrs. It contains distinct living and sleeping areas and shows evidence of an indoor hearth. Other artefacts found at the site include a boat paddle, arrow heads and several ancient headdresses made of red deer antler which would have been secured with leather thongs further supporting ritual activity. The site extends much further than previously thought and it is proposed there would have been several houses adjacent to this ancient lake that spanned several miles. The peaty nature of the soil has helped with the preservation but increased acidity in recent years is causing the area to dry out leading to fears of the stability of any further remains. This is within ¼ of the degree (less than 20 miles) of the grid line in The Keys of Enoch®, Key 215 that pinpoints 0.42 deg West Longitude and that passes through the United Kingdom. This particular find specifically lies along the northern spoke through Great Britain that culminates at the Isle of Lewis. This region contains various examples of ancient peoples including long barrows, round barrows, standing stones and a sacred spring suggesting that far from being simple nomadic tribes-people, they lived in complex societies that showed an appreciation of ritualism and spirituality. Even the name has interesting implications. Carr is said to be from the Old Norse kjarr meaning copse. It was also attributed by the Vikings to those living in the marsh lands. In the West, however, it is derived from the Gaelic word for strength. Could this be a place renowned by the ancient peoples as a place for gathering strength from the stars?